Stainless Steel Machining is one of Forster Tools specialties. 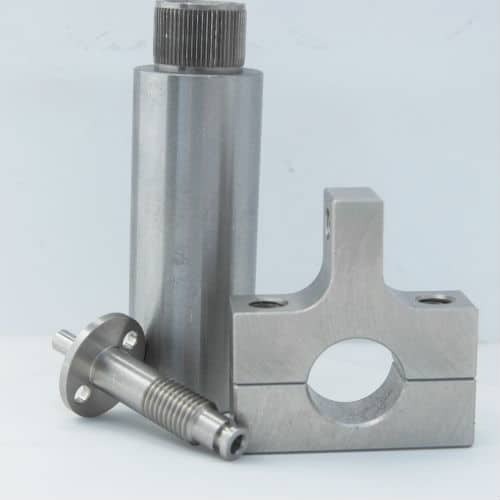 Stainless steel shafts, valves, pins, fasteners, screws, adapters, connectors, and brackets are just a sampling of the Machined Stainless Steel Parts we have produced. Forster Tool will also work with you to produce custom stainless steel parts for any kind of application. We have experience in machining 302, 303, 316, 416 and 440 stainless. Our precision machining expertise not only enables us to maintain tight tolerances and guarantee the quality standards our customers demand, but also reduce the time it takes for our machining processes. As precision machining specialists we pride ourselves on maintaining AS9100D & ISO 9001:2015 Certifications in addition to ITAR Registration. Stainless steel has many desirable traits that make it perfect for a variety of applications. One of the most well known is its ability to resist stains and corrosion, something regular steel struggles with. This makes it a great material for applications where your part may be exposed to things like different liquids or chemicals. Stainless steel also has the ability to "self-heal". The chromium content allows for the material to develop a chromium oxide film, which when damaged and exposed to oxygen will begin to heal itself! Do you need a custom Stainless Steel part made? Contact us with our easy to use online request for quote form or give us a call at 630-616-8177! From prototype to production, we can be with you every step of the way. When it comes to custom machining stainless steel parts, there aren't many shops that can compare to Forster Tool. We give you the world-class service and top quality parts you would expect from any larger stainless steel part manufacturer, along with the friendly, available, and knowledgeable staff that comes with smaller shops. Forster Tool will be there every step of the way when we manufacture your custom stainless steel parts. Even if we can't make the part you need, we can point you in the direction of a trusted industry name or process that suits your part. Send in your free online Request For Quote today! and let Forster Tool answer your questions about machining Stainless Steel.